The development of the shale gas deposits in the United States, led by the drilling and fracking of horizontal wells into the Barnett Shale of Texas at the turn of the century, has opened up a resource that continues to draw visions of American energy independence from a number of commentators. The success of the development in exposing a potential resource that has been found in a number of states around the country continues to underwrite optimism for the short-term energy future of the country. In turn it has led to projected dreams of enhanced domestic supply in some of the countries of Europe, and the rest of the world. However, from that highly promising beginning things have not gone that well (depending on your viewpoint). In part this is because of the overwhelming success of the industry in finding productive formations. 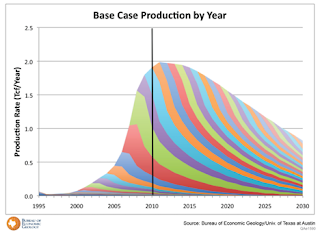 As production spread through the Haynesville to the Marcellus increasing volumes of natural gas fed into the market, which had, at the beginning, only a certain limited capacity to absorb the increased flow rates. As a result natural gas prices, which had been bringing a comfortable profit to companies, rapidly fell. The collapse in price from the high of $10.79/kcf was related to the developing recession, but while the price of oil rebounded, the domestic price of natural gas has not. 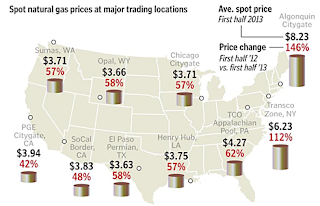 Because of the current cooler weather in parts of the country, gas prices for September are down to $3.35/kcf. This was one of two contributing factors to the problems that the domestic industry is undergoing, both foreseen by Art Berman, an accurate, albeit in some quarters very unpopular, prophet to the industry. 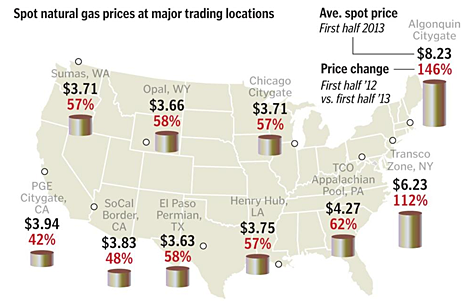 The first problem, clearly is the low price that natural gas continues to sell at in most of the country. (The high prices in the NorthEast are because of the perception that the fuel is abundant, set against the current limited capacity of pipelines to carry sufficient gas into the region.) The second problem, which Art has also clearly identified, lies in the very rapid decline rates that are seen in the natural gas wells that have been drilled and fracked in these shales. The Barnett shale has now been sufficiently well developed that production has now peaked and is recognized to now be in slow decline, though that rate is projected to accelerate. There is also sufficient information such that, for example such industrial stalwarts as the Oil and Gas Journal are confirming some of Art’s earlier predictions. A current article examines the economics of the Barnett shale development under DFW airport, first undertaken in 2009 following a lease agreement in 2006. The article examines the economics of the operation in which the airport has made over $300 million. Chesapeake, who have drilled 110 wells on the property, out of an anticipated 330 originally projected, has recovered some 104 bcf, but the undiscounted all-in cost is calculated at $7.21/kcf. While that was viable in 2008, when gas prices were north of $9.00/kcf it becomes quite a burden when they are down around $3.35/kcf. The loss to the operator is reported to be more than $300 million. These relatively poor returns on investment might not be so disproportionate in Europe where there have been potentially similar shale deposits found in countries such as the UK and Poland. Art has however already reviewed the British Bowland shale projections, suggesting that only 3% of the natural gas estimated to be in place may be recovered. While this is still a respectable number it falls short of the more optimistic numbers that, among others, Bishop Hill has collated. And while Bjorn Lomborg has estimated that this could bring as much as $10 billion a year into the British economy by 2020, this is all at a point where Egdon hopes to sink its first well into the formation at the end of next year. Cuadrilla Resources drilled their first well last year and now plans a six-well exploration program, but it has been suggested that it will be at least a decade before any significant gas production is available. In this regard it is well to remember the case of Poland, where the presence of gas-bearing shales led to predictions that the industry would “transform Europe.” But then the results of the well tests came in, and the volumes of natural gas available were reduced by up to 90%. Although 40 wells have been drilled, to date none are reported to have produced commercial quantities of natural gas, although in only four cases was there fracking of the horizontal well section. Three major oil companies have backed away from committing to the program, and that initial enthusiasm is now considered to have been a “bubble,” while Chevron is seeing more protests over their planned fracking tests. This collapse of hope for a potential resource has led the Polish Government (who are responsible for ensuring that the country has enough fuel at a viable price) to move back toward the greater use of lignite as a power source. Coal is the fuel for the power stations that produce 90% of the country's electricity, and lignite is readily and cheaply available. Prices for lignite (a brown coal that is softer and not yet fully geologically morphed into the harder black coal most envisage when coal is discussed) are quoted as giving a price of $2.00 per gigajoule, roughly a fifth of the cost for black coal. The country has large deposits of lignite, much of which is available for surface mining, at relatively low financial cost. The government decision underscores a point that I have made a number of times, namely that as other fuel costs increase more and more countries will move to the use of coal, where it is domestically available and relatively inexpensive in financial cost, to produce.